The perfect-pink wake up drink. You know the face they pull: we're tired, and don't want to go to school faces. 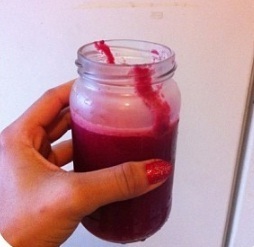 Well, whilst you hurry your little ones into the shower, whip up this juice, and they'll be raring to go. I tested this juice on my nephew, and his friend who had enjoyed a sleepover because it was the weekend, and they both loved it. They were especially intrigued by the (completely natural), colour, which was a bonus. Feel free to add more apples, but this is a fantastic 'good morning' juice, which ideally your little ones should enjoy first thing, it will really get their energy levels up from the energising ginger, sweet apple, alkalising cucumber, and blood-purifying beetroot. 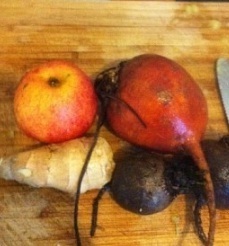 Wash all of the fruit and vegetables aside from the ginger. Peel the ginger, but feel free to leave the skin on the rest of the fruit and vegetables if organic. Otherwise peel, and chop. Push the ingredients through a juicer. Pour into a glass/glasses, and drink immediately. Beware of staining - my (and my nephew's), favourite part of this juice. Red lips and tongues make for a fun talking point, and kids love it.